Poetica Press is the publisher of Materia Poetica: Homeopathy in Verse, Medica Poetica: Malady in Verse, and Botanica Poetica: Herbs in Verse. These unique volumes of poetry by Dr. Sylvia Seroussi Chatroux, MD describe homeopathic and herbal remedies as well as medical maladies. Founded in 1998 by Dr. Sylvia Chatroux, Poetica Press is dedicated to publishing books that use verse to make sense of our world in new and unusual ways. 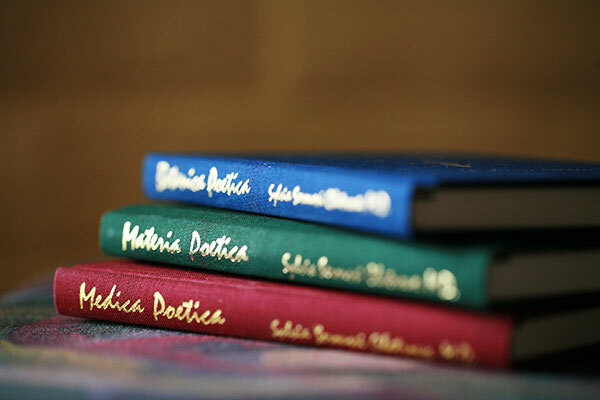 You may purchase copies of Botanica Poetica, Medica Poetica, and Materia Poetica directly from Poetica Press by calling toll-free 1-877-POETICA (if you are outside the US, please call +1.541.482.6156). If you purchase the books directly from Poetica Press, the cost for each book is $20 plus shipping and handling ($5 in the United States).